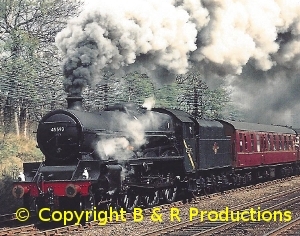 Part 3 begins at Shrewsbury in the 1970s and 1980s with a brief look at the main line runs with steam that returned here on the North-and-West route to Hereford. Back to the 1960s proper, and archive film at Hereford on its route to Gloucester. Then on to Talyllyn Junction for the northern section of the Brecon and Merthyr Railway with its pannier tank service through Talybont-on-Usk and Torpantau. The Aberystwyth to Carmarthen line was another route into South Wales and we travel this route including a visit to its Aberayron branch, a source of important milk traffic. Then southwards to Pencarder and Bronwydd Arms, now home of the Gwili Railway. The Central Wales line from Llandovery to Portardulais and Swansea is shown in the early 1960s including a visit to Swansea East Dock for pre-grouping 0-4-0 tank engines. We travel the Vale of Neath line from Pontypool Road to Neath via Crumlin, Dowlais and Quakers Yard leading through the coal mining area of South Wales and visit Abersychan and Graig Merthyr collieries for their “Paddy” trains. The South Wales main line from Severn Tunnel to Cardiff and Newport in the 1960s is also covered. 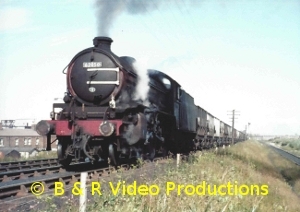 Our archive film has many types of Great Western locomotives from Castles, Halls, Granges and Manors to 28xx, 72xx, 56xx and Panniers. All in colour with an authentic sound track and a highly researched and infomative commentary. Cover Photo:- Dr. Gaius Sutton, 3691 at Bedwas on a Newport to Brecon train. The valleys of Wales once supplied coal to the world. In the late 1960s and early 1970s, some collieries were still shunted by steam locomotives. Here in our second volume featuring these collieries, we portray steam at MAERDY, MERTHYR VALE, ELLIOT, TY MAWR, CYM, MARINE, BENYON BLAINA, CELYNON NORTH, CELYNON SOUTH, HAFODYRYNYS, TAL Y WAIN, BLAENAVON and TREDEGAR. We see examples of industrial locomotives from five different builders as well as ex-GWR tanks, 9600, 9792 and 7754, in all weather conditions from sun to winter snow. Horse worked mines are also visited. These used narrow gauge track and at DARRAN open cast site we see horse traction being used before the arrival of steam. Both steam and diesel BR motive power served the valleys and we record the various comings and goings of coal trains. All filmed in colour by enthusiasts who found these industrial locations both fascinating and friendly after the demise of BR steam in the valleys of Wales. Cover Photo:- Colin White, “Tudor” at Beynon Colliery, 4/6/70. An overall look at steam traction around Britain with views from all Regions of British Railways with particular emphasis on the London Midland. Here, the West Coast main line is covered, particularly the Shap area with Princess Coronation Pacifics, Scots and Jubilees. Banking then was by LMS 2-6-4 tanks. Plenty of action on Dillicar troughs. Bescot, Chester and the Peak Forest line are also included. Western steam at Wednesbury, Shrewsbury and Chester area. The Southern with Pacifics and Moguls are seen on the South Western main line from Pirbright to Micheldever with the odd 9F thrown in and Q1s are seen. The Isle of Wight has the 02 class at Newport. Eastern scenes at Doncaster with Pacifics, Langwith area for freight. Scotland had the A4s and North British freight types on the branches. J27, Q6 and K1 worked the North East coal trains and K1s were on the Alnmouth branch. 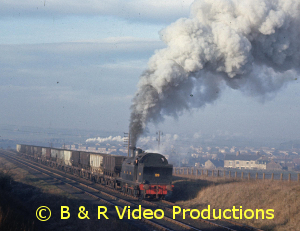 Finally a few Industrial tanks and a look at the end of steam in 1967 and 1968. A highlight at the start is some 1940′s film of streamlined Duchess Pacifics. 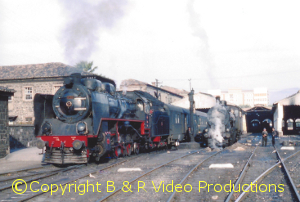 Filmed in colour, except for the 1940s material, this video takes a fascinating and nostalgic look back at the steam scene of the 1960’s. The film has an authentic sound-track and is researched in detail to give an informative commentary.